A couple of years or so ago the Sunday Times ran an article about Harrod's offering fresh produce from their rooftop garden. 'From vine to store within the hour' or something along those lines was the spin. Clearly 'fresh' was at premium and people were willing to pay. And why not? There's nothing like a fresh tomato still warm from the sun. A carrot pulled straight from the dirt at its crunchy best. What about picking green beans and depositing them directly into a pot to be put on the stove? These are pleasures we've had during this lovely westcoast autumn we've been enjoying. All because we decided to plant some seeds and seedlings last spring. We thought it would be good for the kids to see how plants actually grow and reap the benefits of fresh organic veg from our own garden - grown 10 ft from our door. 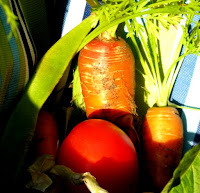 The kids enjoyed seeing the plants grow, fending off the slugs, picking carrots, peas and eating them on the spot. Funnily enough, when their friends came over, picking fresh tomatoes and beans seemed to take precedence over the new trampoline. It may be, however, us adults that have enjoyed the garden the most. 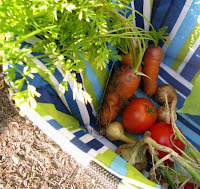 We never realized how satisfying it is to pick fresh veg you've grown yourself, harvest it (we discovered our collapsible shopping basket makes an excellent trug) and serve it up for dinner, knowing it's nothing but healthy for your kids and you. So we say yes eat local but forget the 100 mile diet with its 100 mile radius - if you can, grow your own and you'll reap benefits you never imagined. Browse our collection of Gardens-in-a-Bag and bring the fresh taste of growing your own inside - on any sunny window sill. We've got a great selection of herbs for cooking and flowers to keep the spirit of summer alive. If you have any thoughts or ideas about home gardens or the 100 mile diet, we'd love to hear from you! Please leave a comment below. your site does not allow me access to any page but the home page right now. i was excited to shop at your store.